We know that between Nautilus R616 and Schwinn 270 is rarely compared, because the comparison usually between the same brand but different products. But, we want you to know that Nautilus R616 and Schwinn also have the differences and similarities. We can not see from the price because, it is different even among $100. Then, what things that make you consider to choose Nautilus R616 or Schwinn 270? We will see through this article. The Nautilus R616 is available with 29 customizable programs, 25 resistance levels, 4 user profiles, and other high-end features. All is made for keeping your workouts interesting and challenging. 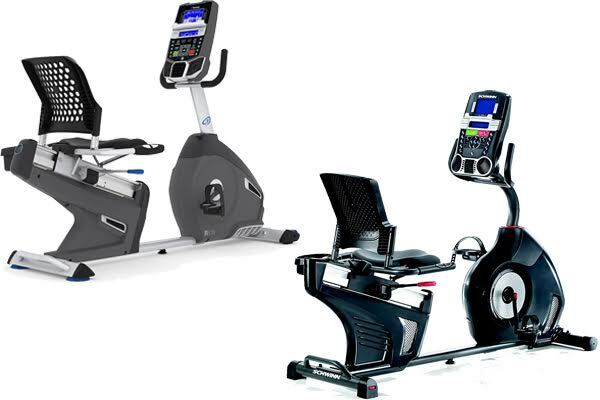 The features like Bluetooth connectivity, USB charging port, acoustic chambered speakers, MP3 port, and blue backlit Dual Track LCD display are for getting you comfort with your many workouts in only one recumbent bike with plus value knowing that Nautilus R616 is lower in price. You can also enjoy a low-impact workout and ergonomic handles with an adjustable padded seat, ventilated lumbar back support, and a grip heart or telemetry enabled heart-rate. It is a recumbent bike that produce an adjustable fan, a bottle holder, media tray, and also a high-speed inertia drive system. You are able to upload the result of workouts to the Nautilus connect account and myfitnesspal.com to track your progress and share with others if you want. And last, Displays are backlit so can be seen in any light conditions. Take a look: Nautilus R616 vs R618. The Schwinn 270 is a very comfort recumbent bike, why? Because, it can heal our back pain problem and stay in shape of our body. The features are really enhanced lower back support and a padded seat for the extra bit of comfort. We can have a lot of postures with getting some cool air while pedaling. It is also impressived us with the 29 programs, heart rate controls, 25 resistance levels, and user profiles. The resistance levels can take you from the lighter workouts to the heavier workouts with only the touching of a simple button. All comes in digital. The monitor is equipped with Dualtrack technology that can display 13 statistical parameters split into two columns (current and progress workouts). You will see the results in form of distance, RPM, calories, intensity, pulse, and so on. And you can save them all to your USB drive by connecting it first to the apps named MyFitnessPal or SchwinnConnect. You will have no worry about taking a bottle of water while you are exercising since it has also a bottle holder on it. One more thing you will get is acoustic chamber speakers for those who loved to listen to the musics. The similarities can be seen from the existing programs, resistance, and total of user profiles. Also, the other features like water bottle holder, Dual Track LCD, and so on. The main differences is clearly on the high-end features that available in Nautilus R616 although we see them like they are almost similar to each other. Schwinn 270 is cheaper but, for a great recumbent bike it is absolutely very enough for us.